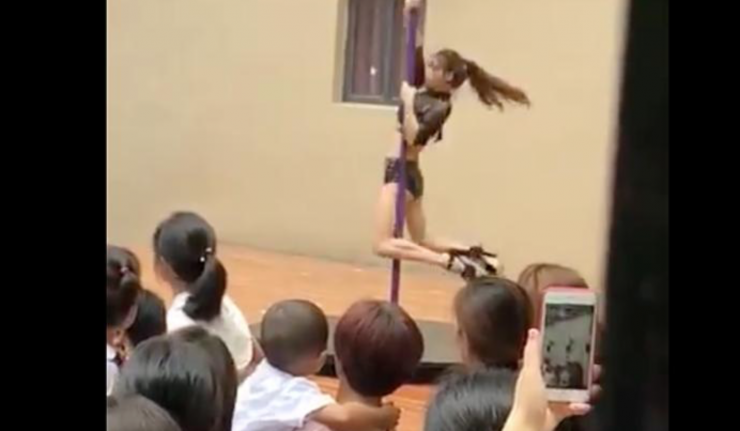 September 5th, 2018 – A Chinese principal was fired after parents objected to her bringing in pole dancers to kick off a new school year. Holding school ceremonies in September is a tradition in China, but most educational leaders opt for principals and alumni giving motivational speeches in place of scantily-clad dancers gyrating on flag poles. Lai Rong, the former principal of Xinshahui kindergarten in Shenzhen, said she decided on this event because of the dancers’ “excellent skills.” Parents in attendance didn’t appreciate the dancers’ skills, however, and focused instead on their children. Outraged messages quickly filled Chinese social media platforms WeChat and Weibo. “Pole dancing at a school welcome ceremony? How can I trust my children with them? I’m going to pull my kid out and ask for a refund,” one parent wrote on WeChat. “Is the principal an idiot?” another parent asked on Weibo. Michael Standaert, and American journalist based in Shenzhen, shared several videos from the event as well as his wife’s interactions with the principal. He said this isn’t the first time the school has used poor judgment in planning celebratory events. This past spring, the principal held military activities with displays of machine guns. “So before our kids got out of kindergarten for the summer, there was 10 days of military ‘activities’ and displays of machine guns and mortars at the door; now the principal has welcomed them back with a strip pole dance on the flagpole bearing the PRC flag. She’s gone nuts,” he wrote on Twitter. Standaert hasn’t updated the status on his kids’ enrollment in Xinshahui kindergarten since his initial tweets, but he did share more details on the phone call his wife had with Principal Lai. The local education bureau launched an investigation following the performance, which led to the firing of the principal and an apology from the school to the students and parents. “The district education bureau believes performing pole dancing for kindergarten children is not appropriate,” their statement said. Chinese authorities have previously dealt with exotic dancers at unlikely events when they started cracking down on rural Chinese residents hiring strippers to perform at funerals. Did the school make the right choice in firing the principal for hiring the pole dancers?